Eight women joined me in Tuscany this week for an eye-opening, heart-expanding, belief-busting, transformational experience. One of the women came in carrying the very painful story that she wasn’t deserving of real, genuine, and lasting love and left ready to open her heart again and let herself be loved. Another who had been taking her husband for granted realized what an amazing partner she has and is ready to make more space in her life and heart for him and for them as a couple. Another woman came to this retreat to “get a man out of her head,” and ended up with seven new women in her life. Some found forgiveness, and everyone found gelato! I have an amazing business coach (yes, coaches have coaches). 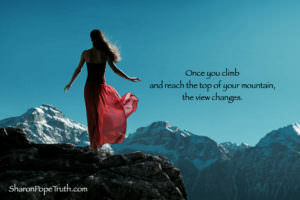 And about three weeks ago she told me that once you climb and reach the top of your mountain, the view changes. The view for these women has changed. They know there is no love they cannot have…. And nothing they cannot become. The word we used this week to describe what was happening was limitless. The horizon we’re looking out upon looks much different than what’s in the rearview mirror. There is nothing that we cannot be or do or have. We are (and you are) positively limitless.